There's no place on earth like Venice, Italy. This city built on the waters of the Adriatic Sea is dreamlike with its elaborate architecture, art-filled palaces, a palpable history that dates back over 1,000 years and, of course, its network of picturesque canals. Venice consists of a tight cluster of islands around the Grand Canal, an iconic waterway plied by gondolas, water taxis, and canal boats. And since there are no cars in the city (or roads for that matter), you must walk or take a boat to see it's many sites. But exploring is pleasant (though slower than the typical American fast pace) and there is no shortage of attractions and curiosities, including inspirational art museums, island jaunts, and beachside excursions. Venice's largest piazza, Piazza San Marco (or Saint Mark's Square), is the city's main meeting place. Lined with cafes, shops, and a number of museums, this magnificent piazza sits at the mouth of the Grand Canal. You've probably seen it in photographs on Instagram, as it's one of Europe's most famous meeting places. While you're there, check out the intricately designed Saint Mark's Basilica cathedral and listen to the bells of San Marco while sipping an Italian espresso and feeding the pigeons. During the 1,000-year reign of the Republic of Venice, its headquarters—and the residence of its leader, "Duke" of Venice (or "the Doge")—was at the Palazzo Ducale. And now, it's a museum. Get a glimpse inside of the rooms occupied by Venice's executive, legislative, and judicial branches. You can even book Secret Itineraries Tour, which includes access to torture chambers, prisons, and the Bridge of Sighs. The museum is huge, so plan several hours for your visit and map out your sights before you head inside. This superb example of Byzantine architecture next to the Palazzo Ducale is dedicated to Venice's patron, the apostle Saint Mark. Attending a traditional Catholic mass at this multi-domed church is a bucket-list experience for those of the faith. But if you're not quite the churchgoing type, book a tour instead and marvel over the treasures inside, including glistening Byzantine mosaics and paintings by leading Venetian artists. This ornamental stone bridge on the Grand Canal is one of the most famous bridges in Venice and is an icon of the city. The city's first built bridge, the Rialto Bridge leads the way to the famous Rialto Market, where vendors sell fresh-picked produce, freshly caught fish, spices, and more. A stroll over the bridge will put you in heart of Venice's crowds—of both the tourist and local variety—but the vibe you experience from the city's commercial and financial hub is one not to be missed. Founded in 1750, the Galleria dell'Accademia di Venezia was the nesting place for an academy of painters and sculptors. Today, it is the best museum for viewing preserved Venetian art from the fourteenth and eighteenth centuries. See works from Renaissance artists like Bellini, Carpaccio, Giorgione, Veronese, Tintoretto, Tiziano, and Giambattista. The museum's collection of art encompasses upward of 800 paintings. Buy tickets online and book a private guide for the best experience. Modern art lovers will enjoy the Peggy Guggenheim Collection, one of the first contemporary art museums in Italy. The museum houses priceless works from the leaders of twentieth-century painting including Pollock, Klee, Mondrian, and de Chirico. Housed in the Palazzo Venier dei Leoni—an unfinished eighteenth-century palace—this museum was once Peggy Guggenheim's lavish residence. Check the website for seasonal events and to buy tickets online. For many Venice visitors, taking a gondola ride is an expensive splurge. But it can be quite romantic and memorable to experience quintessential Venice in this way. Pick a gondola service that brings you away from the hustle-bustle of the Grand Canal and, instead, explores the city's network of narrow waterways. Pass under Venice's famous bridges and take in buildings from a different perspective. For a more economical option, book a group ride of up to six people and split the fee. You can also arrange a ride through your hotel, but they may charge a nominal fee on top of the gondola service fare. Venice's best-known festival, Carnevale (a Mardi Gras carnival), happens in February and includes several weeks of celebration. Venetians dress in period costumes, elaborate masks, and attend fancy masquerade balls. The festival includes a water parade, a "flight of the angel" reenactment and, in typical Italian style, tons of food. It's a rowdy scene (so take note when planning your vacation, if you're not the partying type) but one with loads of free canal-side entertainment. The Biennale Art Exposition happens in Venice every odd-numbered year and lasts from June through November. This tradition, which dates back to 1895, is an essential part of the Venice art scene. Peruse the Giardini Pubblici (the Public Gardens) to see the installments of artists from over 30 different countries. There is also a biennale exposition of architecture and theatre, which occurs every other even-numbered year, if that's more your style. Either way, Biennale always promises a jolt of contemporary in this old-world city. In a thirteenth-century effort to reduce the risk of fires in the city, Venice's glassmakers were ordered to move to the island of Murano. Today, this Venitian outpost is a world-famous destination for colorful hand-blown glass, from simple trinkets to enormous chandeliers. Take the 4.2 Vaporetto water bus from St. Mark's Square to Murano to attend a glass-blowing demo and watch the art form in action. And don't pass up the Museum of Glass where you'll learn about the history of glass-making. The number 12 Vaporetto from stop Nove A in Cannaregio will connect you to Burano, a Venetian lagoon island known for its handmade lace and brightly colored houses. Historians say the houses are painted technicolor so that fisherman returning home in the fog-filled lagoon can see them through the mist. Also located on the island is the historic Lace Museum (Museo del Merletto di Burano) housed in the Burano Lace School, which was operable from 1872 to 1970. Here you can view rare and precious works of lace, from its origins to the present day. Now largely abandoned, the island of Torcello once rivaled Venice in population and importance. Today, it's one of the most visited islands of Venice where you can see Byzantine mosaics in the Cathedral of Santa Maria Dell'AssuntaIt. You can also stroll walking paths on the island, most of which are included in a nature preserve. Spend the night at the upscale Locanda Cipriani or at the Bed and Breakfast Ca' Torcello. If a stay doesn't suit your itinerary, try combining Torcello with a day trip to Burano. In ancient times, Venice's Jewish population was forced to live in a segregated area of the city (in fact, the word "ghetto" allegedly originated in Venice). The two parts of the ghetto, Ghetto Vecchio (the old section) and Ghetto Nuovo (the new section) are both in Cannaregio, about a 25-minute walk from San Marco. Jewish community members still inhabit this quiet area, home to two synagogues and several Kosher restaurants. Take a break from the densely-packed crowds of Venice, and catch Vaporetto 1 to Lido di Venezia, a lagoon barrier island lined with sandy beaches. There you'll find shops, restaurants, bars, and hotels that are often less expensive than those in Venice proper. And going to the beach is free, as most of the sand that runs from Gran Viale Santa Maria Santa Elisabetta to the Hotel Excelsio is public. However, if you'd like to beat the crowds, rent a beach hut from one of Lido's private beach clubs. Considered tapas in Spain, small plates of tasty snacks in Venice—usually paired with a glass or bottle of local wine—are called cicchetti. Enjoying several plates of cicchetti in a bàcaro (informal wine bar) is a great way to experience a slice of local life. Traditional staples like baccala mantecato (salted cod served over a wedge of polenta with a cream sauce) grace the menu in almost every bàcaro. But don't eat too much, as a late-night Venice dinner usually awaits. The Basilica Santa Maria della Salute was built in the seventeenth-century and dedicated to Saint Mary for delivering residents from the plague. (The church's nickname is simply Salute, or "health.") It sits on the point in Dorsoduro and can be seen from Piazza San Marco. The place of worship is deemed a remarkable example of Baroque-style architecture and the interior features several works from a Venetian artist named Titian. When it comes to souvenir shopping, Venice is most famous for handblown Murano glass, Carnivale masks, and lace. If you want a Murano glass keepsake, note that much of what is sold on the streets is cheap imitation product made in China. Don't trust labels that read "Made in Venice" or "Made in Italy." Instead, ask for a certificate of authenticity and remember that if a price seems too good to be true, then it probably is. The Acqua Alta, or high water, is a phenomenon that occurs frequently in Venice during extremely high tides. These tides flood the city's streets and squares, usually in the fall season, and can be best experienced in Piazza San Marco. The event is typically triggered by lunar cycles, low-pressure systems, or high winds. Venetians take it in stride, and so should you. Just grab some rubber boots sold at souvenir stands and wade around the city. The International Film Festival officially takes place on Lido di Venezia. 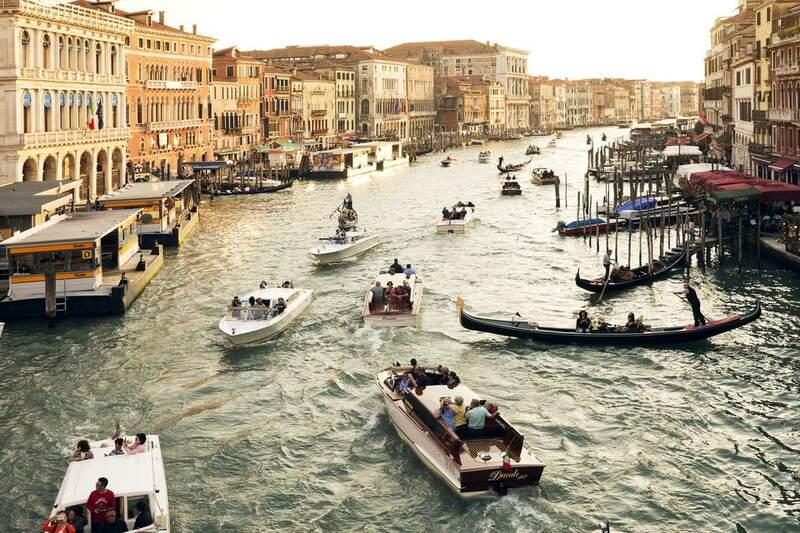 However, the entire city of Venice is abuzz for 10 days each September when cinema's biggest stars come to town. Secure tickets ahead of time to the most popular showings or just sit back and people watch. Your chances of spotting celebrities are high this time of year. Located in the San Polo sestiere shortly past the Rialto Bridge, this authentic fish market features more varieties of fish and shellfish than you can even imagine. Most fresh catches are delivered each day by fishing boats that ply the lagoon and the adjacent Adriatic Sea. This ancient market also has stalls that sell a bounty of fresh fruit and vegetables. The market is open every morning except Sunday.